Banbury United got a boost ahead of Saturday’s Evo-Stik League South trip to AFC Rushden & Diamonds with the news that top scorer Ravi Shamsi will be staying at the club. Shami’s loan from Maidenhead United has been extended until the end of the season. Shamsi has made 24 appearances for the Puritans in his third spell with the club this season and is currently the leading scorer with 12 goals. But keeper Manny Agboola has now returned to Oxford United. The popular Agboola joined the Puritans on-loan in October, following an injury to regular keeper Jack Harding, and made 18 appearances for the club. Harding returned to first team action in last weekend’s victory over Coalville Town. 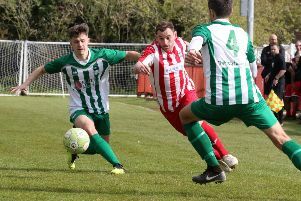 Meanwhile, United will entertain Easington Sports or Bicester United in the Oxon Senior Cup quarter-final. Sports and Bicester meet on Saturday at Addison Road.